Nicholas Vedo ’19 — Life is much like the liberal arts in that it requires solving problems from a variety of angles and disciplines of thought. Before going to Peru for the Global Health immersion course I was quite nervous, I had never been outside of the United States before and was anxious about how different Peru might turn out to be. Peru did turn out to be different in a very good way. Peru opened my eyes to the privileges that I possessed as a citizen of a country as developed as the United States. Peru showed me how truly comfortable my life was compared with that of the local people in Tingo María, Huánuco, and even Lima. However, Peru also showed me how immensely kind and honestly happy its people were on a scale that I had not seen before. Despite the flawed health infrastructure of their country, these people lead their lives to the fullest. I really admire their mentality, and seek to replicate it in my own life. 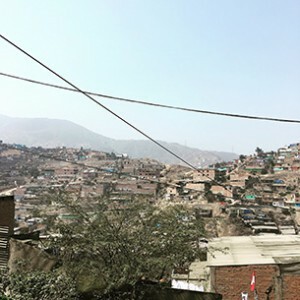 What I noticed almost immediately in terms of health problems in Peru was that often they did not have one single source; rather, there were a host of larger problems that had combined to cause those that we were seeing every day in the cities and towns we visited. For example, in Tingo María one of the local hospitals had a problem with rats because the government had built it directly next to a market. If the government had not failed to put in the necessary resources to build a safe and sanitary hospital, then the health related issues of the locals might have subsided. Just as problems have multiple sources, they also require solutions from multiple views and directions to be fixed. 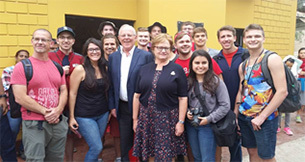 During our trip we met the president of Peru outside of a restaurant in Lima. He was a very kind to us, but it was quite obvious to everyone there that he was a very busy man. The health change Peru needs must come first from the people of the country. Only the people can put the pressure on the government that is needed to cause notable and lasting change. Peru has a lot of work to do and the evidence for that is visible throughout the country. Whether it be in the capital city of Lima, where half of the city resides in slums with little hope of escape or a better future, or in the Andean mountain city of Huánuco, where dogs outnumber people and carry any number of diseases, these problems must be addressed immediately or they will continue to fester and cause greater problems for a developing nation like Peru. 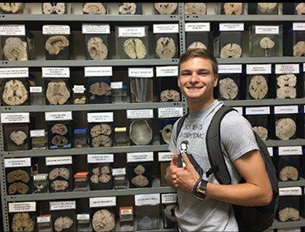 David Vavrinak ’19 — Out of all the activities we did in Peru, the visit to the Neurological Hospital in Lima on Aug. 8 was the most memorable for me. The day began with a presentation on neurocysticercosis by Dr. Javier Bustos. Neurocysticercosis accounts for 25 percent of all reported seizures in Peru and is common in most developing countries. The doctors researching this disease were interested in treating all pigs and killing all the existing parasites, as neurocysticercosis is one of seven prominent diseases that can be eradicated in Lima. The cost of eradication, however, is quite expensive. This lecture really opened my eyes to the privileges we have in the USA, where this type of disease is rarely heard of. In the States, when a disease that is both life-threatening and eradicable becomes an issue, the government provides sufficient funds so the problem does not persist. In Peru, however, the government does not have the same level of resources to provide. As I continue my journey to become a neurosurgeon, this trip to the Neurological Hospital will continue to ring in my head as a source of revelation and inspiration. 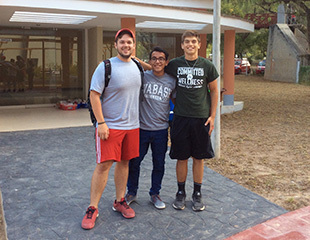 Wyatt Tarter ’17 — While in Peru, I saw a massive number of dogs, or perros. When I say hundreds of dogs over the course of the trip, I am not joking; dozens per day, all wandering around the neighborhoods. Sadly, many were in poor health, and I specifically remember two really examples, which I’ll talk about a little later. Despite their poor condition, it was obvious that the owners loved and cared immensely about each and every one of them. 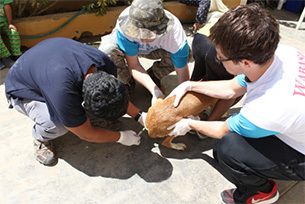 When in Huánuco, we ran a health clinic that tried to help the people and pets. Chase and I were assigned to the pet clinic portion, and our duties primarily involved holding the pets while they received shots, deworming medicine, and were sprayed to get rid of fleas. One family brought three different pitbulls, each around 60 pounds, and another brought four different dogs and a cat. One of the dogs was brought in a burlap sack because the family was worried it might have an extremely contagious disease. One of the doctors proceeded to give him a shot through the bag, and after he did, the dog started bleeding excessively from the place it was pinched. It turned out the dog had mange, and its piteous squeals still stick with me. Matt Hodges ’19 – It is easy to let a sense of hopelessness creep in standing between the dilapidated houses and garbage piles of Pamplona. Clean water is scarce or nonexistent, feral dogs prowl the streets carrying disease, and looking out away from Lima it appears to go on ad infinitum, the population numbering well into the millions. To complicate matters, the developed regions of Lima (Google ‘Larcomar, Miraflores’ to get a glimpse of what I’m talking about) continue to thrive just a stone’s throw away. Despite virtually every set back in the book, Casa Huertas stands out as a stronghold of hope and vision. Through education, instruction, consistency, and love, local volunteers and the Global Health Initiative have established a foundation to support and orient the next generation as they grow up in this deserted and barren environment. Through fun lessons and projects dealing with recycling, plant growth, hygiene, and many more, the children in the “Growing Together” program are learning to live sustainable, conscientious lives in a safe and consistent environment. The message of sustainability and resource management isn’t only for the children, either. Through programs like SUMI (a microbusiness producing baskets and other goods from recycled newspaper) and the community kitchen, women in the area are given opportunities to exercise their independence and provide for their families. With a flower bed, herb garden, and dirt soccer field, Casa Huertas and its associated programs are making the surrounding region brighter and brighter, little by little, day by day. The example set by Casa Huertas is a massive call to action, especially to those in the Global Health community. I realized standing there between the junk and the dogs that this small group of people, with no electricity and one hour of running water per week, creates more direct positive change in two little rooms during any given week than I have managed to during my 19-year privileged life. I am not saying we should shun our culture and upbringing due to the existence of inequalities in the global economy. I am simply saying that we should strive to improve the future both globally and on a community level just as much as the dedicated individuals at Casa Huertas, especially since we belong to a community that doesn’t have to deal with many of the setbacks and challenges faced by the residents of Pamplona. No individual can fix the poverty in Lima, just like no individual can fix the refugee crisis or the AIDS outbreak in Scott County. But what each person can do is put their drop in the bucket and use their unique background to make an effort towards a better future. Ben Geier ‘18 – During my time in Peru, I found that two conversations really helped to shape my view of the current medical situation in the country. The first of these came while I was shadowing one of the local general physicians, Dr. Martín, while the second came while I spoke with the head of the hospital in Pillco Marca. While I conversed with Dr. Martín, we came on the topic of how their health system is set up. He explained that in Peru there are three levels of hospitals. The level of the hospital dictates how much medical intervention said hospital can perform with its patients. For example, a level one can essentially only do physicals, minor tests, prescribe drugs and refer patients to bigger hospitals. What shocked me the most was his comment that people who need surgery (or some form of serious treatment) are almost entirely out of luck. In order to receive that level of treatment, he or she must purchase an overnight bus ticket to Lima (a trip which takes 10 hours). The second conversation with the head of the hospital was something that helped to solidify my understanding of the healthcare system. The thing that stuck out most was when he discussed government funding. He mentioned how they receive little funding making it hard for them to treat the people of the surrounding community. In order to purchase medicine or other necessities they spend little to no resources on simple commodities like toilet paper, or even soap. The quote that got me was when he said something along the lines of, “sometimes we feel forgotten”. Jacob Covert ’18 – One of my greatest experiences in Peru was the amazing opportunity to shadow and be the right-hand man of a Peruvian doctor at a medical outpost in Huánuco. The doctor gave me insight into many of the problems that his people face on a daily basis from gastritis, to lower lumbar issue, to malnutrition. All of these issues are prevalent problems not only within Peru, but also within the larger global health context. Furthermore, the doctor had me working with a Peruvian medical student who helped me to understand that many of the medical problems of Peruvians stem from a lack of education about nutrition, wellness, and general health. 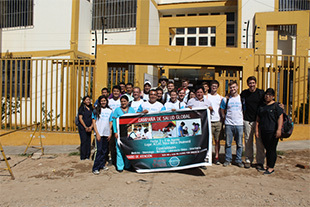 The educational deficits are also a larger global problem that the global health approach tries to tackle by educating local leaders who, in turn, teach the larger community. Being able to peer through the eyes of another individual, let alone a whole other culture, truly has changed the way I understand the world and the role of global health in it. 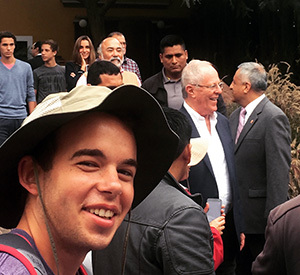 Kevin O’Donnell ‘19 – It was our first full day in Lima and I was still trying to wrap my brain around the fact that I was out of the United States for the first time. Everywhere we drove was a new experience. I was actively comparing every little thing that we passed driving through the capital city of Peru. The first work we did was with the children of Pamplona Alta. These kids acted strikingly similar to U.S. born children around that age. We helped them make sock puppets. They were so happy and didn’t have a care in the world, but the kids that were closer to our age only wanted one thing –they wanted to take selfies. We were amazed at the low level of security protecting the president. When we finished the tour and were waiting for our bus, the first lady of Peru walked out and almost instantly recognized Wabash College and asked if it was in Indiana. We talked for a little bit and asked for a picture, and she just simply stated that we should wait for the president. Talk about being in the right place at the right time. Samuel Hayes ‘19 – The Global Health Initiative immersion trip to Peru was an unforgettable experience to say the least. Culture shock set in as soon as we exited the airplane in Lima, and it lingered for the rest of our time there. While in Peru, we visited areas throughout Lima, and other communities such as Huánuco, Tingo María and Pamplona Alta. Every destination had its share of poverty and health issues. In some instances, the degree of poverty exceeded anything I could imagine witnessing in the United States. 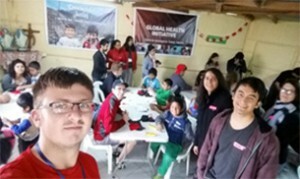 We spent time volunteering in a health mission in Huánuco, and it was probably one of the most eye-opening experiences I have ever had. We assisted doctors in their practice, veterinarians in their treatment of animals from the city, and helped educate the locals on what a good, nutritious diet would be for all ages. I witnessed first-hand the suffering of many individuals, children, and their pets, and my perspective on the needs of people around the world became much more accurate. I feel like one of the most important issues that needs to be addressed in Peru (at least in the communities we visited) is animal control. Everywhere we went, there were tons of dogs running around the street, each harboring its own infestation of parasites and disease. The health of the dogs itself is a huge issue; however, the problem does not stop at the dogs. Many of the families in the communities around Peru considered many of these dogs to be pets, which means they allow these unhealthy animals to come around their homes and families, bringing their diseases into the homes. In our time assisting in the treatment of those animals, my classmates and I saw many dogs with an unbelievable amount of fleas and ticks, and those are the only vectors we could see with the naked eye. We also analyzed feces samples from dogs in Pamplona Alta and we found eggs of parasites in many samples. I believe that if an initiative was taken to educate people in these communities on how to take care of their pets, a lot of easily avoidable health issues would decline in frequency. Chase Francoeur ‘17 — Huánuco, only 10 years ago, was a city of slightly under 75,000, but has since seen an influx that has boosted population by 230%. Combined with sup-par infrastructures, few resources, and poor health care, this would often spell disaster for many areas. What I witnessed in Pillco Marca, a southern district of Huánuco, showed little different than what I expected. We first became aware of Pillco Marca through the health clinic that we set up in partnership with Universidad Nacional Hermillo Valdizán (UNHEVAL), which was held at a health center (compound), in the district. As we exited the bus for the first time to enter the center, we witnessed a line of nearly 20-30 individuals, covering all age groups, that stretched from the entrance gate down the side of the road. As we entered through the gate and finally through the glass doors, we saw a rundown center with small leather benches that had rips all the way down them, and many places with the ceiling exposed to the open air. At any given time of the campaign I estimated a minimum of 100 patients and volunteers inside the building with only three restrooms per gender available, none of which contained toilet paper, soap, or paper towels. Although I was personally involved with the veterinarian portion of the campaign held outside the building (but still within the compound), I overheard descriptions of the poor conditions that this population was enduring. Many times the locals were living with their health problems for 6-12 months, if not multiple years, before ever entering a doctor’s office, and many were unable to continue with treatment after their visit because they could not financially support it. The same situation was also evident on the veterinarian side. Many of the dogs (perros) and cats (gatos) that we saw were only there because the free clinic was being held, and if it had not been held, many of these animals would continue to endure their condition. I would estimate that 90-95% of the animals we saw had either fleas or ticks, and of those, about half were so infested that if you were to push their hair against the grain, you would not see skin but a black sea of bugs. Some individuals would bring a couple of their pets, return with two or three more, and then come back after an additional period with even more — it was hard to imagine that they were not just rounding up the local dogs and cats on the corner of the street and bringing them. Not a single animal we saw throughout our two days of work, which was approaching 100 total dogs and cats, were spayed or neutered, and throughout the duration of our time in Huánuco, I think that every animal I saw was capable of reproduction. This is a staggering fact when considering how many animals roam the streets and alleys searching through piles of trash for food. The resulting feces simply remains in the areas that kids go out to play, ultimately fulfilling many parasites life cycles as the children lack proper sanitary habits. Our time in Huánuco, and specifically our experiences at the clinic, left me questioning how is it possible to improve these conditions to levels comparable to what I see in the U.S.; barring an enormous improvement of multiple aspects of infrastructure, nutritional food availability, and health education to name a few, it’s difficult to see how this would happen. Although the U.S. has those without access to health care and some populations exist with conditions similar to those witnessed, the commonality of it in Huánuco is was what truly left a lasting impression. 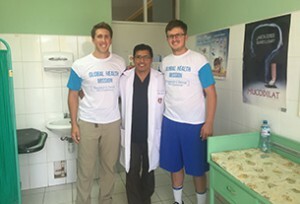 Jared Cottingham ‘18 – I spent the day working with other students in the veterinary section of the clinic in Huánuco, which was an interesting experience. The sheer number of pets per household was unbelievable; each home likely had a minimum of three dogs or cats on average. The veterinarian treated almost every animal for fleas and ticks, which led me to believe that the animals had spread a great deal of insects and possibly disease throughout the household, therefore affecting the people within them. It was very unusual to think of these animals serving as potential vectors of disease and affecting the family, as this is relatively unusual in the United States. 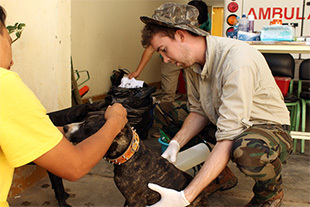 Year-round veterinary care could easily avert these effects, however that level of care just isn’t the case for this portion of Huánuco—making our presence even more important. As I walked about the clinic and observed what was going on, I began to notice a lack of soap and toilet paper/paper towels within the restrooms. Additionally, many areas of the clinic were not roofed. Working in a hospital myself, this was utterly shocking to me. How were the workers and or patients washing their hands? I immediately began to think of the potential bacteria and disease that were being passed throughout the clinic and was truly moved. Even in a place of healing, community members could not be properly isolated and protected from infection. This was a sobering realization. However, I couldn’t put my earlier sentiments entirely out of my head. As the children brought literal bags of animals into the clinic, something unfortunate dawned on me. These children, maybe five or six years old, were given responsibilities that children of the same age don’t have in the United States. I can’t imagine a child of this age bringing in four animals to the veterinarian back home. Furthermore, as we walked throughout the community passing out flyers for the clinic, I came across a young boy carrying a pail of water that was much larger than he—yet another example of the immense amount of luxuries we are afforded within this country. If a child wants a drink of water, they walk to the fridge. In Huánuco, the same child would have to walk nearly a mile or more and carry a full pail back to the household.